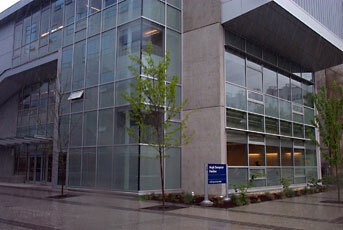 The Hugh Dempster Pavilion (DMP) is at the hub for the computer science community at UBC to unify the administrative and teaching centres. The Pavilion is named after Hugh Dempster, a former computer science professor, who was renowned for his compassion for undergraduates and was one of the original four faculty members to join the Department in 1968.The Pavilion houses three medium lecture theatres as well as two smaller classrooms. Each of the three floors contains a central lobby with individual study spaces. MECH students often have lectures in the DMP lecture theatres, or tutorials in this building. A video of one of the lecture halls in DMP. For more information including location, building hours, and 360 degree views of lecture theatres please visit UBC Learning Spaces.